Wilco In Concert Hear the group perform a full concert, webcast live on NPR.org from Washington, D.C.'s 9:30 Club on Wednesday, Feb. 27. John Doe will open the show. In more than a decade of making music, Wilco has weathered a tumultuous label change, infighting and lineup changes, drug addiction, and depression. It's also emerged as one of the most innovative, influential, and widely revered bands making music today. Hear the group perform a full concert, webcast live on NPR.org from Washington, D.C.'s 9:30 Club on Wednesday, Feb. 27. John Doe, formerly of X and The Knitters, opens the show. Wilco is on tour to support its latest release, Sky Blue Sky. Much less experimental than the band's previous two albums (A Ghost Is Born and Yankee Hotel Foxtrot), Sky Blue Sky finds Wilco returning to its more acoustic and country-rock roots. Though some critics were disappointed by the album's lack of sonic innovation, it's become Wilco's most commercially successful release to date. Typical of any Wilco album, Sky Blue Sky meditates on love, loss, and frontman Jeff Tweedy's ongoing struggle with inner demons. But there's more ambivalence and resignation here: Relationships will or won't work out, people will or won't learn from their mistakes, and dreams will or won't come true. In the end, as Tweedy sings on the closing track, none of it matters since "we're designed to die." 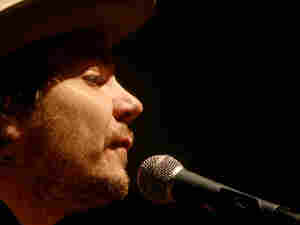 Wednesday's live concert webcast marks Wilco's third for NPR Music. The band first appeared in the series in 2005 following the release of A Ghost Is Born and again in 2006, in conjunction with its live album Kicking Television. Opener John Doe co-founded the L.A. punk band X 30 years ago, and since then, he's been massively influential. X incorporated a variety of roots music into its punk sound, and in the process laid the groundwork for Doe's own solo career. His new album, last year's A Year in the Wilderness, is a hooky collection of rootsy rock.